Parametric filters provide independent adjustment of the centre frequency, gain and bandwidth of the individual filters within the filter bank. They are superior to graphics equalizers, which are restricted to the adjustment of gain alone. 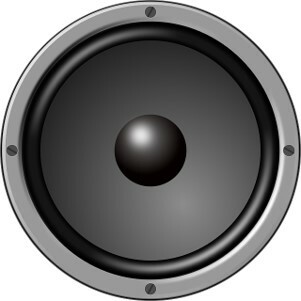 They are widely deployed in audio and musical applications. Signal Wizard allows parametric filters to be designed and executed in real time with ease, either using a FIR or IIR approach. 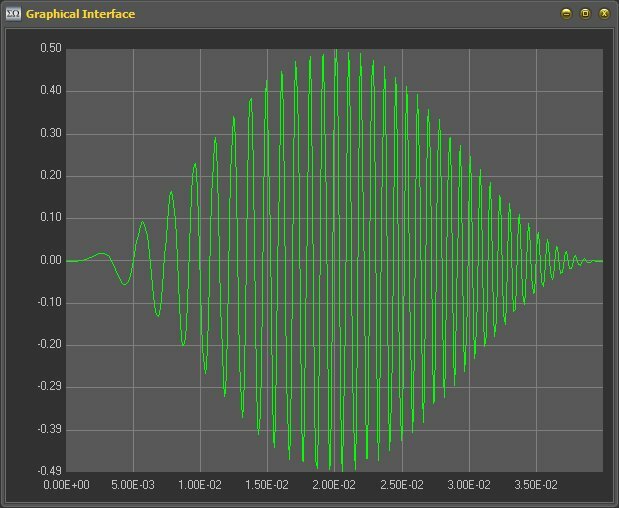 Signal Wizard also goes beyond normal parametric approach – even the phase of each filter can be precisely defined. Parametric example. The first frequency response shows a filter (FIR approach) with two peaks: the first at 4.5 kHz with a gain of 12 dB, and the second at 13.5 kHz with a gain of-12 dB. 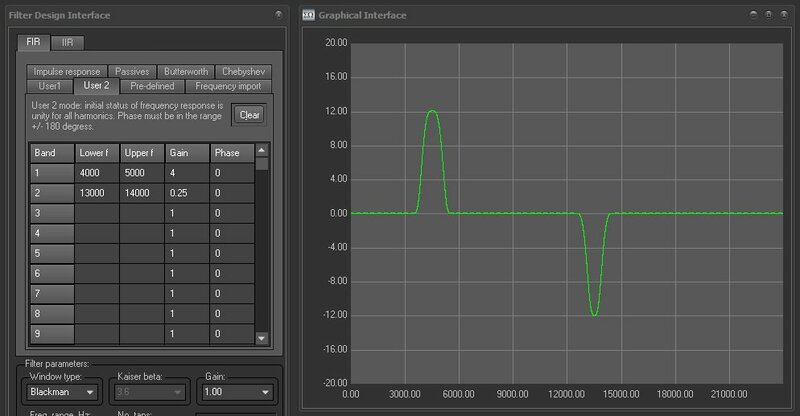 The Signal Wizard Filter Design Interface shows the input parameters. In the second trace, a third peak has been added at 9 kHz with a gain of 6 dB. Neither the bandwidths nor the gains of the original two peaks have affected. Arbitrary filter execution is one of the most powerful features of Signal Wizard. An arbitrary filter is specified by importing a text file which represents the chosen frequency or impulse response. Either real or complex frequency filters may be designed, allowing complete phase control. Arbitrary example. The plot shows a time-domain swept chirp signal, shaped by a Hanning window, which has been imported into Signal Wizard. This can now be downloaded into the hardware and used to filter any signal in real-time. This will enhance regions of a signal that contain a similar chirp and supress noise. In fact, it is a form of matching filter. Signal Wizard allows the user to import any kind of impulse or frequency respons (real or complex) imaginable, specified as a text file. Since it is run as an FIR filter, it will always be unconditionally stable.